The topic for today is how cheese makes you happy! That's right. There is evidence that the nutrition in cheese can actually affect your mood among other things. I'm pleased to bring you this great news today! The history of cheese. Exactly how did cheese get started? What's the tradition there? I don’t have a lot to report today about the farm. A bit about hay, the creamery and a story about the goats and their antics. 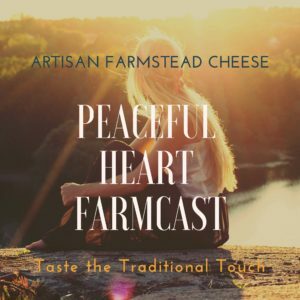 Today’s Peaceful Heart FarmCast is about how we came to live the homestead life and how we decided to create a small artisan cheese business. What happened last year, where did I go? Hello everybody. Melanie Hall here. Hope you are doing well. Are you ready for the podcast to get going again? I sure am. One change you’ll notice is that going forward I’ve rebranded the podcast. The name changed from Village Wisdom Podcast to Peaceful Heart FarmCast.